Have you ever gone on a trip and wanted to start planning to return before you had even left? That’s kind of how I felt when I was down in Florida at the end of April. 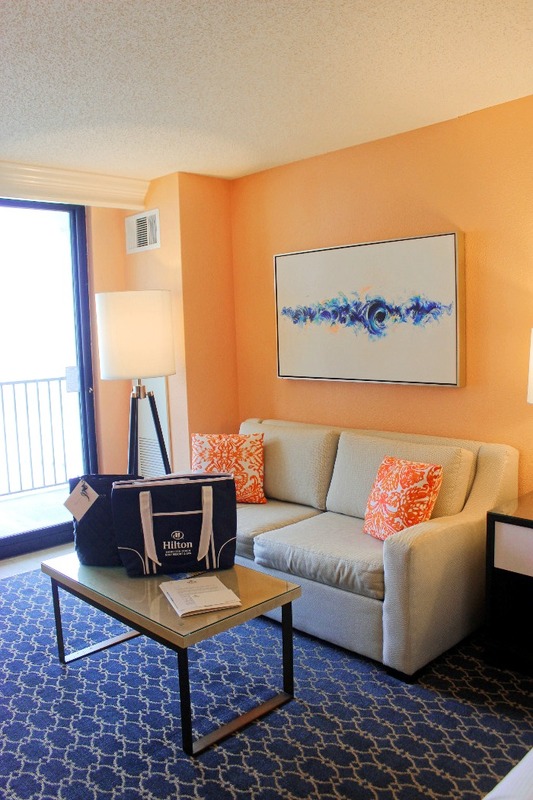 I was invited to fly down to the Hilton Sandestin Beach Golf Resort & Spa for a few days to soak in some relaxation and to check out the South Walton Beaches 2016 Wine and Food Festival! I was so excited when the invitation showed up in my inbox, my plane ticket was booked soon after that and I was counting down the days. My flight down to Florida was super early on a Thursday morning and even though I was running on little sleep and was still having pain from my kidney stones, I packed up my bag and hopped on a plane headed for the beach. From the beaches to the spa to the festivals and the amazing steakhouse, I couldn’t wait to tell my husband, Thomas, all about it. I knew that this would be a vacation destination that I just had to share with Thomas and with y’all! I was down in South Walton for 3 days but oh how I wish I could have stayed longer. A lot went on during my trip and while I originally though I could fit all of it into one post, it looks like I’m going to break it down into two post so that this doesn’t turn into a super, super long post with a million photos. haha. But I’m getting ahead of myself, let’s start off with…. While I was down in the South Walton area, I got to get my beauty rest at the gorgeous Hilton Sandestin Beach Golf Resort & Spa. 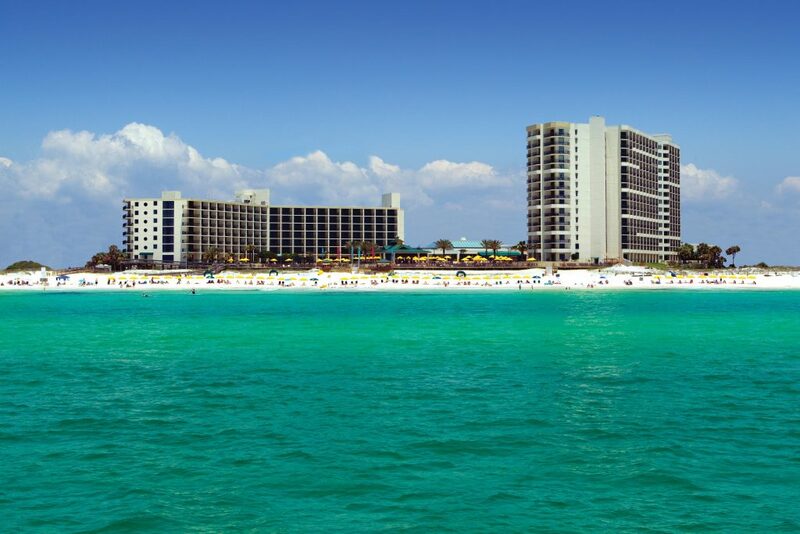 When I plane touched down at Ft. Walton early Thursday morning, I was whisked away to the Hilton Sandestin Beach Golf Resort & Spa for my weekend adventures in Florida. I seriously think that you could enjoy your entire vacation without needing to step off of this resort. 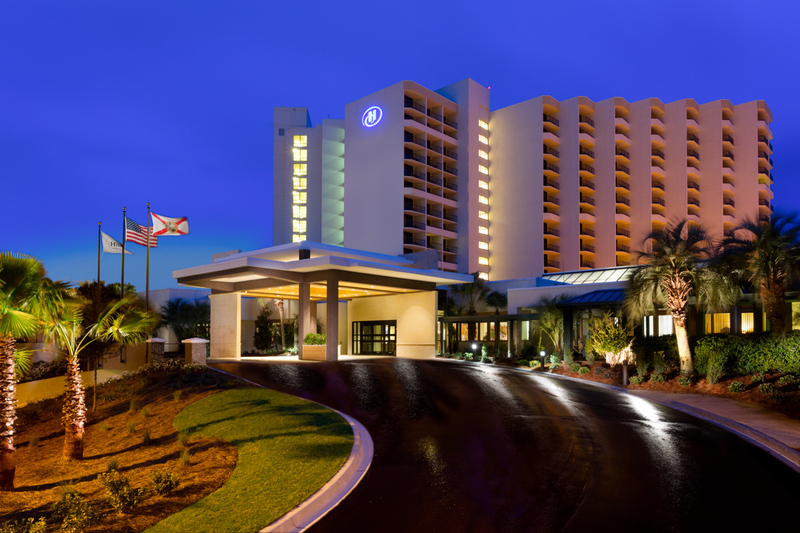 The Hilton Sandestin Beach Golf Resort & Spa has 602 deluxe guest rooms and suites, six restaurants (including Seagar’s Prime Steaks & Seafood which is Northwest Florida’s longest-standing AAA Four-Diamond Restaurant), plus an indoor pool and hot tub, 2 outdoor pools, 1 outdoor hot tub, and an outdoor kiddie pool. 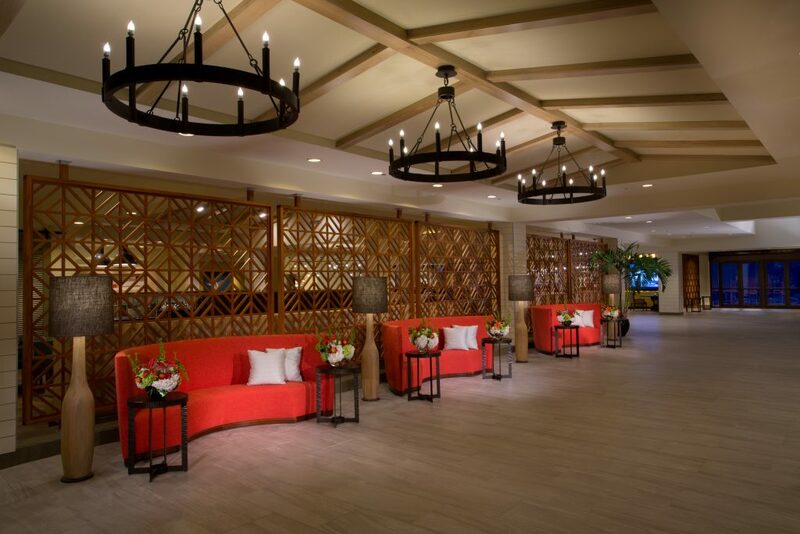 The Hilton Sandestin Beach Golf Resort & Spa also has it’s own fitness center, nail and hair salon as well as a world-class 14,000-square-foot spa, Serenity by the sea! I checked in early and then went to settle into my room. I was exhausted from getting up at 2am for my flight and my back was starting to bother me a bit. Since we didn’t have anything on our schedule for the day until 4 that afternoon I was planning on tossing my suitcase into my room and then crawling under the covers to catch a few more hours of sleep. However, once I got to my room, my travel adrenaline kicked in again as I opened the balcony door and heard the crashing of the waves. That’s when I knew that sleeping would have to wait. My beautiful room was located in the Spa Tower and over looked the pool/bar area as well as the ocean! I had a huge king side bed to myself, which I don’t know about you but when I travel alone, I absolutely love having a giant king size bed all to myself! haha. There was a little sitting area towards the balcony as well as small table with chairs that I used as my “office space” while I was down there. Yes, even though I was there to relax and enjoy the Hilton Sandestin Beach Golf Resort & Spa and the South Walton Beaches 2016 Wine and Food Festival, this was still a work trip. 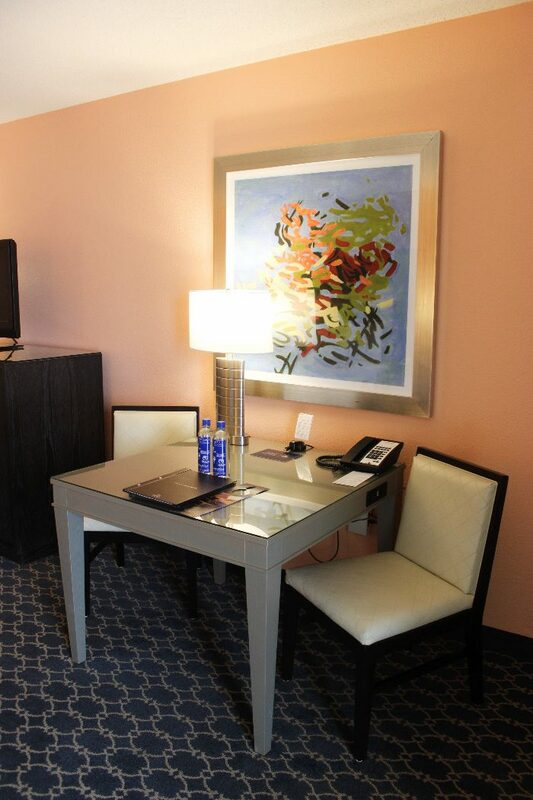 I love hotels and resorts that have little work areas like this so that I don’t have to try and juggle my laptop and notebooks in my lap while I’m trying to work. The room was gorgeous, I had two sweet little gift bags waiting on me when I got up there, such a sweet welcome to the Hilton! There was a giant TV in the room also but to be honest I didn’t even turn it on. There was way too much to explore around the beautiful resort to stay in the room being glued to the TV! There was also a little bar area with a mini fridge, coffee maker and microwave. This was perfect for me because I don’t like to waste food but they gave me wonderful huge servings when I would order food. 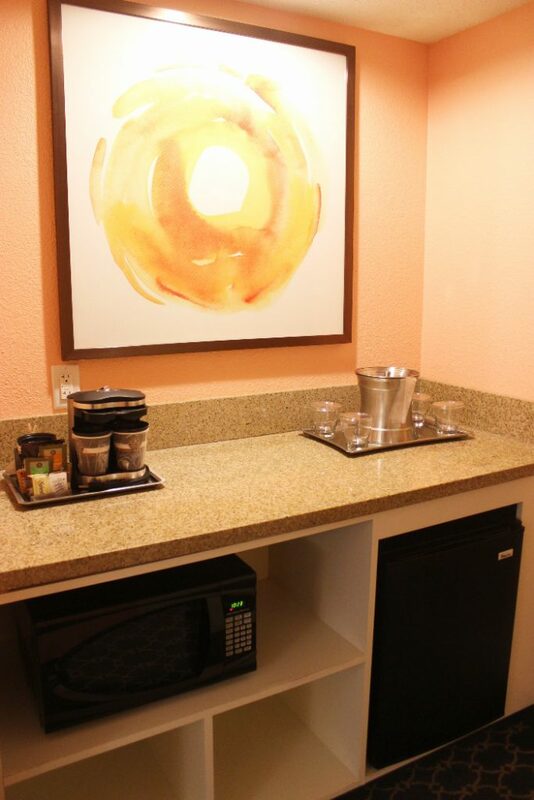 I especially loved the mini fridge when I was storing fruit to have on hand in my room! As much as I wanted to nap, I decided to freshen up a bit and explore the resort a bit while I looked for something to have for an early lunch. After walking around for a bit, I found myself pulling up a chair in the outdoor patio area of Barefoot’s Beachside Bar & Grill! I wasn’t sure if I could eat a lot that early but I looked over the menu for a bit and decided on the Shrimp Basket! I thought it would just be a few fried shrimp and a handful of fries but what was delivered to my table was a bit more! 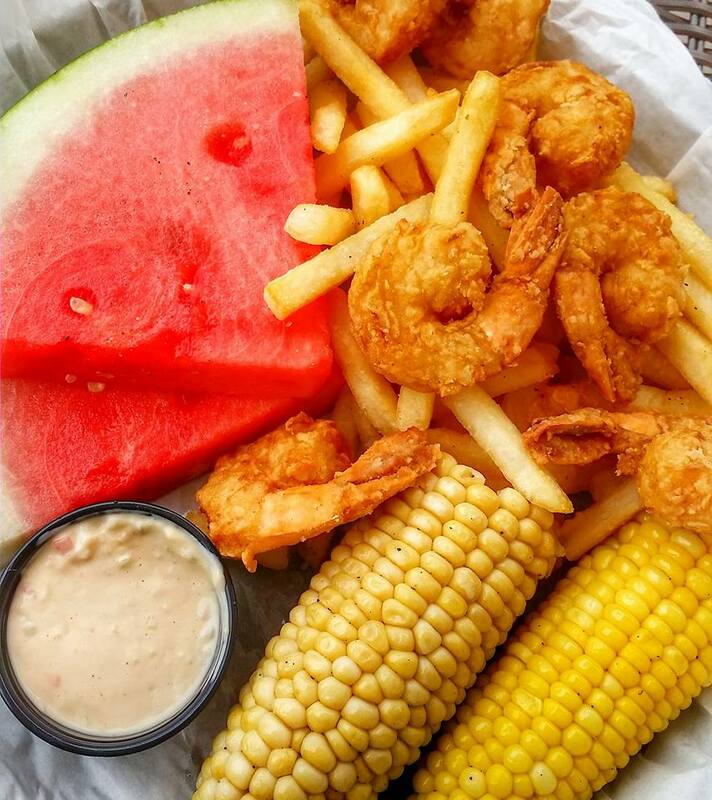 The fried shrimp basket came with large jumbo fried shrimp, a huge amount of fries, 2 ears of corn and 2 huge wedges of watermelon! It was a huge but perfectly coastal lunch for my first meal of the weekend by the ocean. Did you know that you can order food from their beach-side restaurants online and have it delivered to you poolside or straight to your beach chair?! How awesome is that! I listened to the music flowing from the bar’s speakers while ocean waves crashed beside me to the left as I snacked on my coastal lunch. I could have sat there all day soaking it in. Something about those ocean waves and salt air just calms my soul. 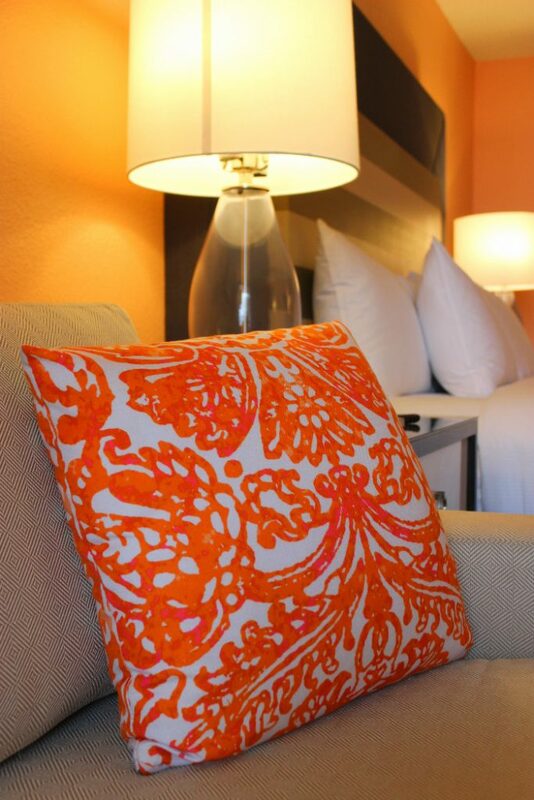 After a little relaxation, I went back to my room to change and get ready for the evening activities! 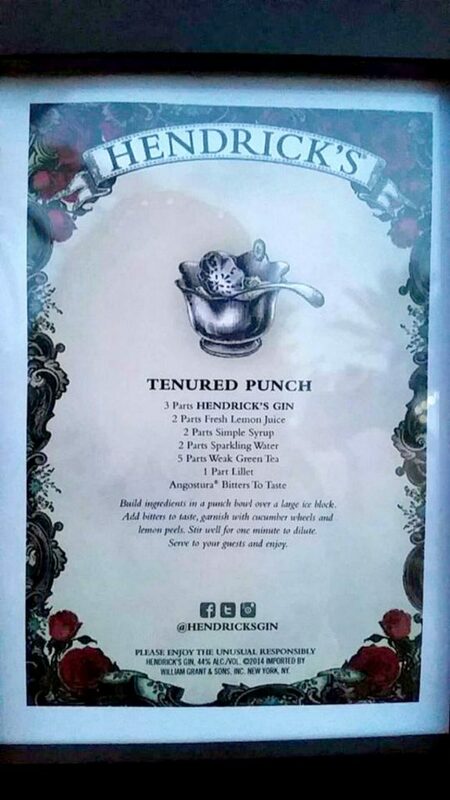 We (and by we I mean the group of bloggers that were invited to Florida) were invited to the VIP Meet and Greet with Winemakers and Industry Night at the Hilton Sandestin Beach Golf Resort & Spa. 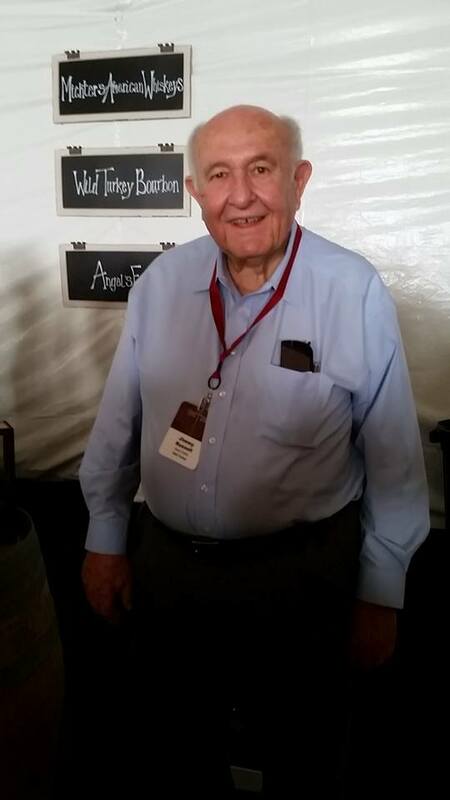 This wonderful and classy party was hosted by wine and festival founder, Chan Cox and we spent the evening mingling with each other, sipping on a few glasses of Prosecco and nibbling on a few treats that were being served around the room. Of course after a glass or two of Prosecco and a new nibbles we were ready to have dinner. Our Hostess took us over to Sandcastle’s Restaurant for a quick evening meal before we all retired to our rooms. 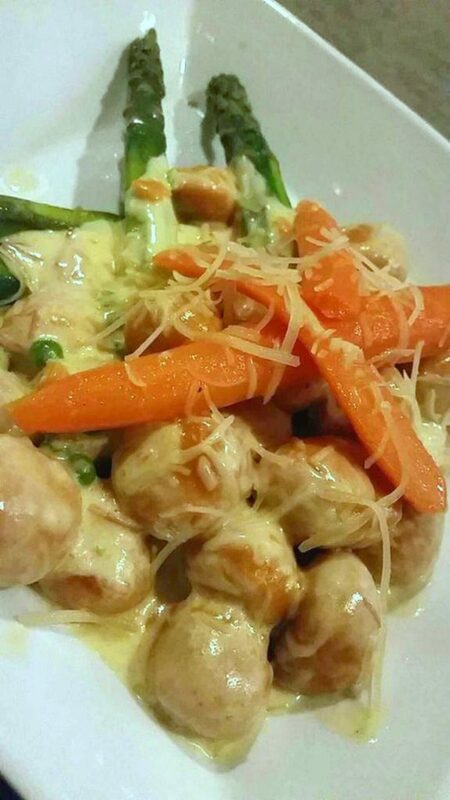 I had the creamy sweet potato gnocchi with prosciutto, peas, asparagus and baby carrots and it was fantastic. I’ve had regular gnocchi before but sweet potato gnocchi just takes the cake! Normally this dish comes with Mahi Mahi but the chef was kind enough to make us the dish sans Mahi Mahi since we just wanted the gnocchi! We totally told them that they should add the sweet potato gnocchi with prosciutto, peas, asparagus to the menu as a vegetarian option, it was that good! After dinner a few of us took a few minutes to run out to the gulf and watch the gorgeous sunset. The day has been a little overcast and windy but oh the sunset that evening totally made up for that! Every where you looked the sky was just beautiful! 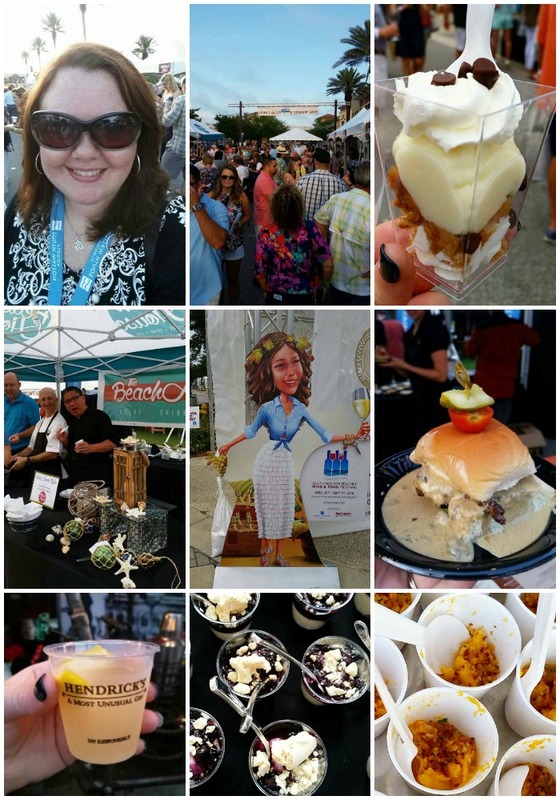 Also while we were down in Florida, guests of the Hilton, we got to spend quite a bit of time at the South Walton Food and Wine Festival this year! 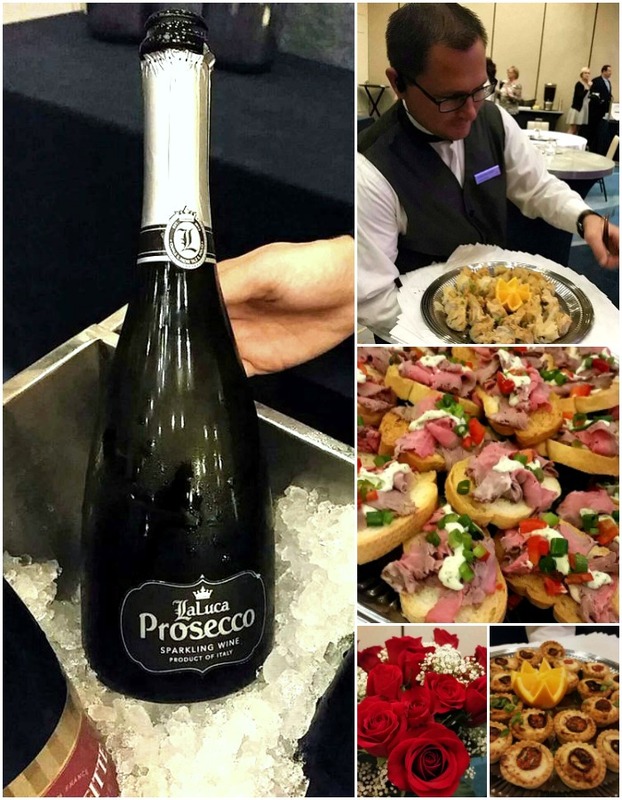 We had a blast tasting foods and sipping on different champagnes throughout the weekend! Whooo I know that was kind of a long post about the Hilton Sandestin Beach Golf Resort & Spa but it was totally worth it! Check back soon because I’m going to be chatting about their spa and the South Walton Beaches Food & Wine Festival in the next few posts here on BigBearsWife.com! 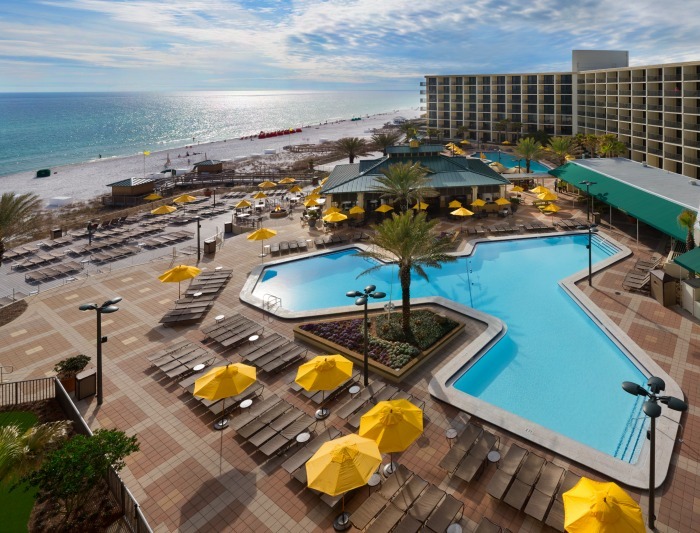 I was invited to stay at the Hilton Sandestin Beach Golf Resort & Spa and I was invited to the South Walton Beaches’ Food & Wine Festival but all options are 100% mine. great post…thanks for sharing this experience. I know where I will be staying when I make it out that way! I’m so jealous… looks like it was a fabulous trip!!! I have never been to this area (yet!) Someday! I love it when a resort has the beach right there and an equally inviting pool. Choices! The food looks great too. 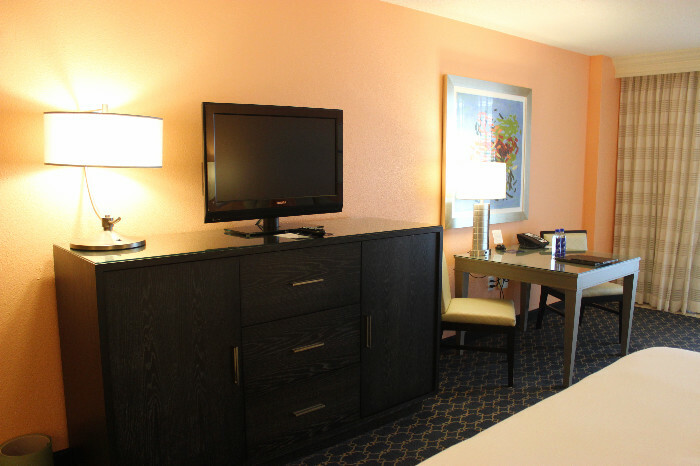 The rooms… look quite comfortable! I would be all over that shrimp basket and that view during your lunch sounds perfect! Ahhh this looks like so much fun! I am desperate for a vacation!! Thanks for sharing your experience! I can see why you’re planning your return visit. This place looks incredible and the food photos are making me SO hungry!!! Ok I am a little envious (A LOT envious) and I know I want to go stay there! The resort looks wonderful! Thanks for sharing your experience! Your photos should be on postcards! Seriously stunning! Love everything, so jealous! Glad you were able to enjoy yourself after that horrible kidney stone situation! I’ve never been to Sandestin Beach but it’s on my travel bucket list! The festival looks like it was such a blast! What a great vacation! 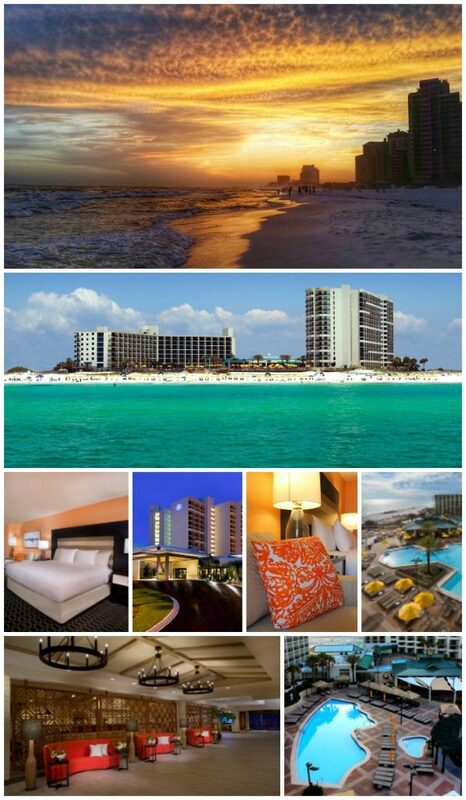 We haven’t been to Sandestin yet but the when we do go the Hilton looks like the perfect option! Kidney stones?! Aww. That stinks! Especially during a trip. I have so many things I want to say about this post! – 2am wake up time for a flight? OMG. I would have been totally dead all day! – The Hilton looks absolutely gorgeous! Love the rooms and that shrimp basket looks sooo good. – I want to go now! Looks like a gorgeous place to stay. We so love Florida and all that it has to offer, a wonderful vacation destination!! It was an eventful trip for sure, but the memories, the views, and that gorgeous hotel was worth it. I was following on Instagram and wishing I was there. It looked like so much fun. Are you feeling better? B had kidney stones last month and landed in the hospital a couple of times. It’s no joke. What a gorgeous property! I could seriously get into that sweet potato gnocchi. Everything there just looks so incredibly beautiful!!!! I’m totally jealous of this trip! The hotel, the food, everything! Looks like you girls had a fantastic trip! Loving the photos. What a fabulous trip, Angie. A place I’d love to visit! I love Christy (Southern Plate), btw! FUN for you!